For the first time since last year's Hurricane Irene scare, New York City's Metropolitan Transportation Authority completely shut down at 7 p.m. on Sunday night. For the first time since last year's Hurricane Irene scare, New York City's Metropolitan Transportation Authority completely shut down at 7 p.m. on Sunday night as Hurricane Sandy made her approach. Well, to be totally fair, the shutdown takes eight to ten hours, so it won't be completely closed until early Monday morning. 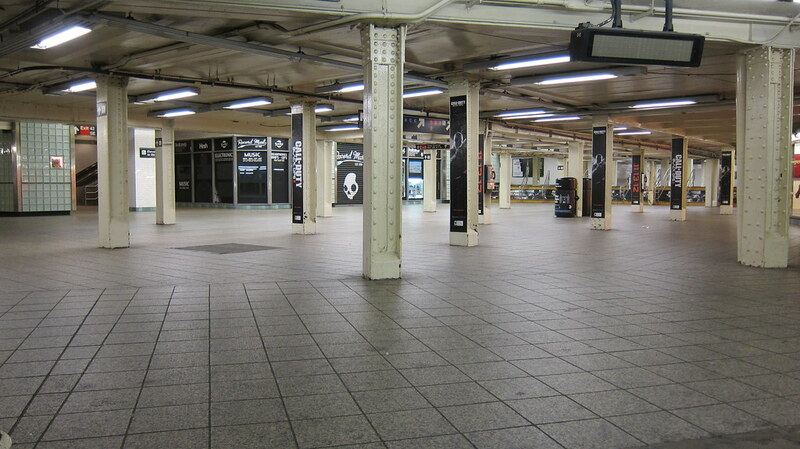 But within a couple hours of the turnstiles' going still, the subway stations were completely deserted, a rare sight to behold in the city of 24-hour everything. The MTA offered up some images of the desertion on its Flickr page. Quite frankly, we're glad we don't have to go down there. It's pretty creepy-looking -- not to mention the fact that it could be terribly flooded in a few hours' time. Above is Times Square, the busiest subway station of them all, on Sunday night. The platforms don't look terribly different, when you're on your way home from the bar on a Saturday night. Except there's less of a chance some knife-wielding villain will mug you. A mutant rat seems more likely in this scenario. Grand Central Terminal also closed down. All that's missing now is Will Smith running through with a pack of werewolves chasing him. It's too late to stock up on snacks. Penn Station was also abandoned. The Long Island Railroad (LIRR) station is pictured above, empty. Watch the last train leave Grand Central Station. To those remaining in Manhattan, we hope you don't sink. Read more Hurricane Sandy coverage here.